Some people enjoy having their dogs share their living space -- at least for some of the time. This can present a problem when you are trying to maintain your floors. A dog's nails can scratch the surface of many floor tiles, but some types of floor tiles are more resistant to these scratches than others. Porcelain tile is constructed from porcelain clays using the dust-pressed method. These tiles are fine grained, dense, smooth, frost resistant and virtually impervious to water absorption. Porcelain tiles are one of the hardest flooring materials available for residential and commercial use. They stand up well to heavy foot traffic, including pet traffic. While it is possible that your dog's nails may scratch the surface of porcelain tile, since the color and pattern runs through the tile's entire thickness, the scratch is less likely to be noticed. Ceramic tiles are made from fired clay. Ceramic tiles are not at hard as porcelain tiles, but they are still tough enough to stand up to the light scratches made by most kinds of dogs. Ceramic tiles typically utilize a glazed finish which carries the color and pattern. If the glaze gets chipped or scratched the damage is more noticeable than the same damage on a porcelain tile. Ceramic tile is typically less expensive than porcelain. Natural stone tiles are good choices for people who have dogs in their home, but different types of natural stones have different levels of hardness, and therefore scratch resistance. Granite tiles are among the hardest of floor tiles. Marble, travertine, limestone and slate are other available options. A dog's nails may scratch these surfaces, but natural stone tends to develop a patina with use that can add to its natural beauty. 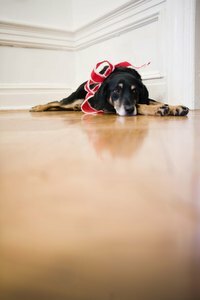 Hardwood floors are not among the most dog-friendly of floor surfaces. Hardwood may absorb some odors, including food odors, which may encourage dogs to scratch at the floor. Hardwood may also absorb dog urine resulting in dark stains and persistent odor. Hardwood is susceptible to scratching even by dogs with trimmed nails, although hardwood floors that are sealed with a high quality polyurethane coat are more resistant to scratches.